The above is the verbatim text printed on Nanotec Systems' latest loudspeaker cable. We received a generous length of this cable to connect our Avantgarde Duo Omega loudspeakers with. That meant sufficient length for a run to the mid-horn, from there to the lower tweeter horn and finally to the powered bass section. Mind you, the cable arrives unterminated. While we were still trying to figure out the physics behind the effects of photons bombarding optical data carriers, we had gotten in touch with Nanotec Systems to ask questions. Nanotec is the manufacture of the Nespa series of photon cannons. Unfortunately the inventor of the Nespa passed away and his college Mr. Takeshi Hayashi could not help us further. Nevertheless, Hayashi-san offered us to review the latest installment of the #79 cable instead. This offer we accepted the more so because this cable sits in the affordable price sector. The cable arrived swiftly from Japan and there we found the quoted printing on the full length of the cable. With the enclosed leaflet, we could get an idea of what was intimated by the writing on the cable jacket. First Nanotec states that Music Strada is an amalgamation of nano-chemical technology and electronics - a blend of something chemical and a cable. In the beginning of 2006, this culminated in the Golden Strada #79 loudspeaker cable. A pure oxygen-free copper conductor was treated with a colloidal liquid containing minute silver and gold particles. The nomenclature's #79 derives from the atomic number of gold. Another benefit of adding tiny 3.5 to 8 nanometer-sized gold and silver particles to the surface of the conductors is the electrical effect. The enhanced conductivity of the added metals atop the copper is said to positively influence skin effect. 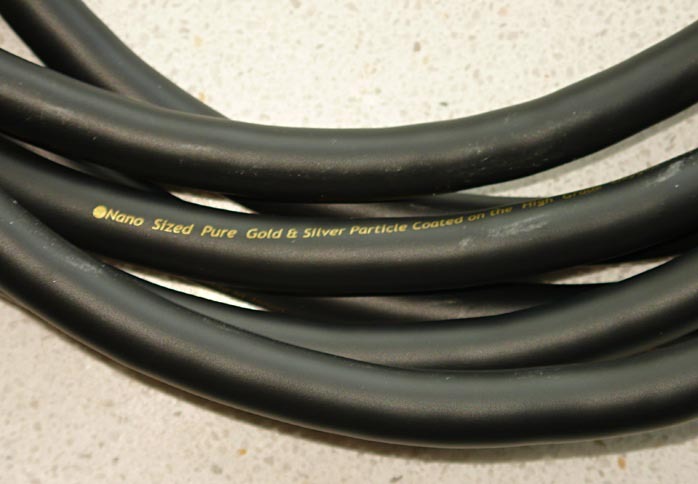 A cable treated thus should demonstrate enhanced high-frequency response. The added metal particles supposedly also help electrons to easier traverse from one conductor to the next for a smoother, more detailed and natural sound. The colloidal liquid is further claimed to help prevent oxidation and sulfurization of the copper and work as a buffer against internal vibrations. This was all already the case for the original Golden Strada #79. The new nano 3 version is an enhanced version. Nanotec Systems tripled the amount of gold and silver particles in the colloid. This gives away another part of the text on the cable, nano 3. Instead of just tripling the dosage, Nanotec according to Hayashi-san spent a great deal of time and effort in finding an optimal balance between the gold and silver particles. A simply three times higher level of gold particles ended with a heavy, almost dull sound. Merely tripling the silver content resulted in an overly bright sound. Samples where the original balance was kept but the amount of all particles tripled led to undesirable effects. In the end the best results were obtained with a tripling of the total amount of particles in a 90/10% ratio of gold and silver. That's the metallic content of the colloid. On with the liquid itself. The documentation thereof isn't highly revealing. Hayashi-san explained that the liquid is the oil from the liver of a deep-sea shark. It is in fact squalane, purified squalen oil. This oil is no stranger to audio as odd as it may seem. This oil is also used to clean connectors and to treat graphite CD mats as Boston Audio does. In medical circles this oil is also used in the fight against tumors. What makes the oil special is its ability to bind and thus deliver oxygen in animal and human bodies where needed. The shark it is harvested from lives in such deep waters that sunlight does not reach it, temperatures go down to -55 degrees C and water pressure is immense. Scientists found out that the oil in the beast's liver does the trick of keeping the predator alive and well. Nanotec chose the oil for its oxygen-binding quality so it wicks away any copper-threatening oxygen with it protective layer. Next, the oil is also friendly to the PVC sheath. Hence nano meets chemical technology. The combination is truly a world's first, it seems. With this novel technological approach, Nanotec Systems enjoys the benefits of a gold and silver infusion combined with the easy accessibility of OFC copper. 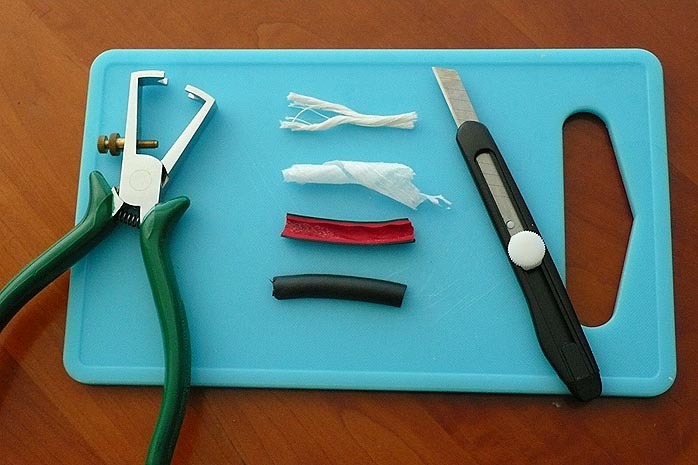 Developing and producing a pure silver and gold wire requires an extensive R&D budget. By using their core competency as embodied already in their company's name of Nanotech in combination with readily available products, the Japanese team arrived at interesting results. As the cable comes without terminations, it was up to us to pick connectors. 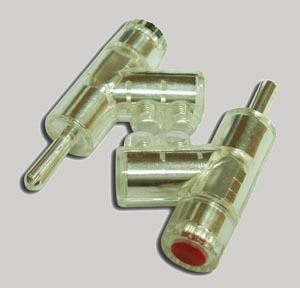 We had good results previously with the Dutch Crusade Audio video connectors so we ordered up a few pairs of their locking bananas, heavy silver-plated, stackable and at €19.95/pair, priced friendly. The black 10mm PVC outer sheath sports a red inside layer. There we found a wrapping of Japanese rice paper and when we peeled that away, the red and white wires twisted together with pure cotton strands appeared. Each wire consists of 50 strands of colloidally treated 0,18 mm OFC copper. For as pure a connection as possible, we screwed the wires directly into the Crusade connectors without soldering to avoid another material junction. Nanotec recommended to run the cables in for 2 to 3 hours, which we did after laying the cable out between the Audio Note Meishu and Duos. The cable has a nicely heavy feel without going extreme and is supple enough to route easily. After the recommended hours of playing, we started a listening session with the Hadouk Trio Live at FIP, Johnny Cash V and Jan Garbarek's Officium. The GS #79 nano 3 is not a neutral cable (if such even exists). It has a character of its own and it is a very pleasant character. It has an affection for the wood section of the orchestra so to speak. The voices of the Hilliard Ensemble on Officium benefited from their own richness plus a little extra whereas Jan Garbarek's piercing saxophone acting as the fifth voice rounded off somewhat prematurely. With large orchestral pieces, Dance of the Tumblers of Rimsky-Korsakov for instance, that 'annoying' triangle became a bit less annoying. To get a better impression, we switched out the Duos for the Podium Sound Podium 1 planar speakers. These large bending-wave panels do not attenuate in the treble by -3dB as most speakers do. In combination with these, we only had to use one single run of cable. Replaying the Garbarek tracks, the prior observations remained although the richness in the voices was now somewhat more towards the lower midrange. Overall the Nanotec cables do remarkably well at this price. Bass is firm but well handled and fast. Musical detail is easily transmitted and soundstage information is plenty though not to the same degree as some more expensive cables will reveal. As saxophone and piano pieces proved, the cable never adds glare but is slightly rounded off at the very top. Quality of packing: Cardbox box with cable ends protected by caps. Completeness of delivery: Includes product info. Website comments: Unfortunately in Japanese only, Google translation not very helpful. Dealer websites we found were not very informative. Global distribution: Company manufactures in Japan and distributes in Asia, Europe, North America and Africa. No list of distributors. Human interactions: Very helpful, polite and responsive. Other: A terminated version is planned for the future. Pricing: Very good for the quality on hand. Final comments & suggestions: A real world loudspeaker cable that uses novel technologies to keep pricing down.